What a lovely card, Bunny. I love this sweet design, and I found your card (and blog) through Word Art Wednesday. I just had to come by and say hello. I would love to have you visit my blog too, and maybe even become a new follower. Have a lovely week. Thank you, Sierra. I did get a chance to go to your blog and view your lovely cards. I especially liked the school card. Thanks for visiting me. A very pretty card. I love the use of the glossy accents. Thank you for joining us for the Classy Cards N Such blog challenge. Very Festive- the embossing folder is a perfect choice too. Thanks for joining us at Penny's Paper-Crafty Challenge. Beautiful Christmas card! 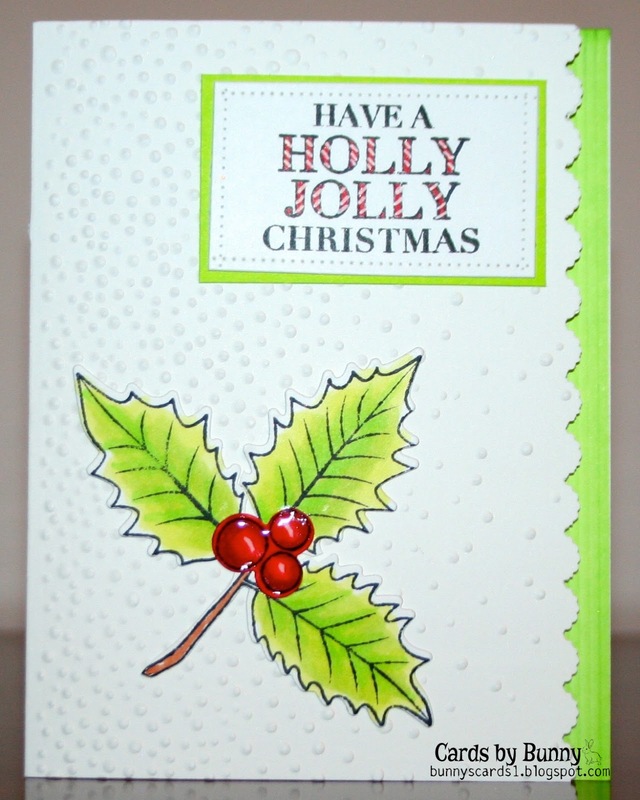 Love the embossing folder and the C&S look! Thanks for joining us this week at QKR Stampede! Oh no..........now it's stuck in my head, too. I can see the little Burl Ives snowman singing it. Very pretty! Love the lime green,; it's almost traditional, but not quite. Love the stripes in the sentiment, too. Very cute. Thanks for playing with CHNCC2. Great job, love the embossing on this cards, well done. Thanks for playing our challenge at Lil Patch of Crafty Friends. I love the detail on your card! From the background to the coloring to the special edge. Thanks for joining Fun~day Friday at Jo's Scrap Shack. This is very nice. I like the glossy berries! Thanks so much for playing along with the Simon Says Stamp Wednesday Challenge. Clean, simple and outstanding Christmas card. Thank you so much for playing and sharing your awesome creation with us at Lil Patch of Crafty Friends.